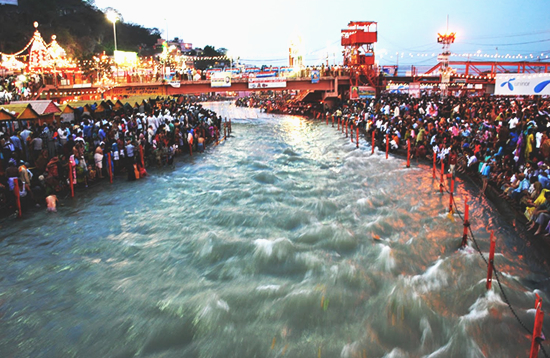 Haridwar has with it a history that traces back to the mythology of Hinduism. It is considered to be the holiest of places in India. Situated on the bank of river Ganga, Haridwar enjoys a place of pride as one of the most popular pilgrimage destination in India. It is just the perfect place for nature lovers as the serene beauty of nature combine with the spiritual ambience to create a heavenly atmosphere. This is one among the four places where Kumbha Mela is organized. If you happen to be there during the time of the fair, you will be teased out of your thought by its sheer magnitude. The sea of humanity is in itself worth the notice. The city of Haridwar is only 10 km away from Rajaji National Park. If you are a wildlife lover or a die-hard adventure maniac, make sure that you visit this wonderful place. Situated in the state of Uttaranchal, the city is easily accessible by air, road and rail. Haridwar is only 214 km from Delhi and 386 km from Agra. If you wish to journey by car, it will not take more than just a few hours to reach here. Haridwar also has a railway station and is well connected by rail. The nearest airport is just 35 km away at Kotdwar. If you are planning to spend a vacation away from the din and bustle of daily life, this is the place where you should be. Located in the foothills of the Himalayas, Haridwar is a tourist hot-spot. The clear blue sky, the glimmering mountains on the horizon and the murmur of River Ganga, is too irresistible an attraction. This wonderful place offers excursion tours and trekking trails that you will never find anywhere else in the world. Haridwar has some very interesting places which you must visit. Just 6 km away from the city of Haridwar, this temple is situated atop a mountain on the bank of river Ganga. Neel Parvat (Blue Mountain) as the mountain is called, is just a 3 km trek from Chandighat. In the Hindu mythology, Goddess Chandi symbolizes power. The temple is dedicated to the Goddess who it is believed killed a demon. Although you can climb the hill, there is also a ropeway for the not so strong visitors. Har Ki Pairi ghat is the prime tourist attraction of Haridwar. This wonderful riverside bank was constructed by King Vikramaditya in memory of his brother Bhartrihari. It is said that all the sins that a mortal commits are washed out by bathing at this river-bank. In the evening just when the Sun is about to go down below the horizon, priests perform the religious rite on the bank of the river. This is extremely scenic and people join in the devotional song. After the ritual is over, small candles are floated on the river. The place looks enchanting. The atmosphere is very peaceful and you will surely love it. 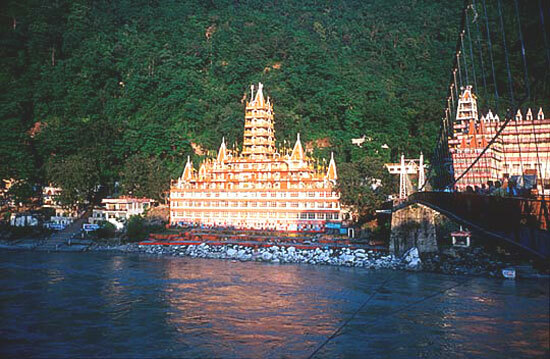 Rishikesh popularly means "the abode of the saints". 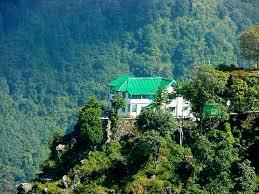 Situated in the state of Uttaranchal, this beautiful place is at the foothills of the lofty Himalayas. It is just 24 km away from Haridwar and is an ideal base camp for tours to more remote touring destinations like Kedarnath, Badrinath, glacier of Gangotri and Yamunotri. This four destinations are together called Chardham. These places are high up in the Himalayas and Rishikesh serves as an ideal launching pad for such an expedition. The scenic beauty of Rishikesh is a thing to behold. It is surrounded by lofty mountains while River Ganga flows through it. The climate of Rishikesh is continental as it is located far away from the coast. The summers are pleasant as it is at the foothills of the Himalayas and the winter is generally chilling cold. Nevertheless it is a very fine place to go on a vacation. The best way to travel to Rishikesh is by road. The place does not have an airstrip but it is easily accessible as it is only half an hours journey from Haridwar. The place is 238 km from Delhi, 42 km from Kotdwarand only 25 km from Haridwar. Rishikesh is also famous for its souvenirs. There is hardly any big departmental store in Rishikesh but the place is famous for its indigenous handicraft industry. Here you will find items made of shells and beads. Rishikesh is also famous for garments like sarees, kurtas, rugs, etc. Quality woolen garments too are available here. Rishikesh has some quality hotels where you can put up. Attractions of Rishikesh are manifold. Tourists who come here have different interests that can vary wildly from trekking, pilgrimage, white water rafting and even treatment. At Rishikesh, you can enjoy the wild fury of nature as well as its serene and scenic beauty. The place is very much associated with the Hindu mythology and thousands come here for pilgrimage. Rishikesh is also famous for the sadhus (saints) and people come here to learn Yoga from them. Today it is universally accepted that Yoga is a great alternative therapy. Thousands of people come here to practice this healing art. rekking trails that you will never find anywhere else in the world. Haridwar has some very interesting places which you must visit. The place has quite a few temples. Each of these temples are extremely beautiful and is worth a visit. There are also a few eating restaurants where you will find some good Indian delicacy. Here people are vegetarian and you will not have the opportunity to taste non-vegetarian food. There are also few shops that sell wonderful handicrafts. The beautiful statues that can be found in the area speaks volumes of the skill of the people. Just one hour drive from Rishikesh uphill is the Vasishtha Goofa where famous saint Vasishtha meditated on the banks of the Ganges. The cave is very peaceful and is indeed a perfect place for meditation. Rishikesh is also famous for its hiking trails and white water rafting. This is one tour that you will remember for a long time. Kotdwaris a picturesque valley set amidst the Himalayas, Shivaliks, Ganges and Yamuna. This breath--taking hill resort located in the foothills of the Himalayas is one of the prime tourist attraction in the state of Uttaranchal. The climate of Kotdwaris so beautiful that during the time of the British rule, they turned Kotdwarinto a fine summer resort. Today Kotdwarhas some fine institutions that hold a place of pride in the Indian socio-political and economic scenario. Kotdwaris the gateway to the Garhwal region of Uttaranchal. 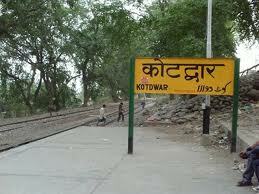 Kotdwaris very well connected with New Delhi by road, rail and air. The nearest airport is the Jolly Grant Airport and this is only 25 km away from the city of Kotdwar. The city is linked very well by railways and there are quite a few trains like the Shatabdi Express, Mussorie Express, etc. There are a number of hotels in Kotdwarthat will provide you with all sorts of facilities. If you want to splurge and desire to spend the days at Kotdwarin luxury, there are grand five star hotels that will spoil you with pleasure. In case you are in a budget tour of the place, even then you will find plenty of hotels in the city where you can live comfortably albeit at a low price. The best time to visit Kotdwaris in summer when the temperature remains moderate. However, if you love the challenging mountains, snowfall and chilling cold, you come here even in the winter and enjoy Kotdwarwith a difference. Kotdwarhas some very famous places. Among the famous temples in Kotdwar, Tapkeshwar Temple is very famous. If you want to get a detailed description of the places of visit in Kotdwar, see the link in "Places to Visit". Kotdwarhas some extraordinary places of tourist interest. The beautiful climate of Kotdwarattracts visitors from all over the world. The city also has a very good tourism infrastructure. There are many beautiful guest houses and very good hotels that provide excellent accommodation for the tourists. Once you are in Kotdwaryou will have plenty to see and enjoy. The place has a number of attractions where thousands of tourists flock every year. The meaning of the name of this wonderful waterfall is "thousand fold stream". At a distance of only 11 km, from the city of Kotdwar, this wonderful waterfall will surely tease you out of your thought. The Baldi river and the caves will give you a breathtaking view of the wonderful scenery of the place. Near this place of perpetual shower, there is a sulphur spring. The presence of chemicals in the water is said to be very useful in curing different types of skin diseases. about 5.5 km from the city bus stand you will find one of the most ancient places of worship in in Kotdwar. This temple is situated on the bank of a small stream. The name of the temple is given because of droplets of water that fall on the rock. On the occasion of Shivratri, thousands assemble to pray to the God. This beautiful temple is a must see tourist place in Kotdwar. This forest range is one of the finest ecological reserve in the valley of the Shivalik Mountain Ranges. It has quite a variety of flora and fauna. There is not only dense forest cover but also fine grass lands and this supports a large number of mammals of different species. The best season to go for a tour of the park is between November to the middle of June. A safari through the park is going to be an experience for you. The Kotdwarvalley is famous for water sport and if you really want a taste of it, head straight for the Asan Barrage. Situated along the Chandigarh-Shimla highway, this popular water sport resort is only 43 km away from the city of Kotdwar. There are a number of water sports like water skiing, kayaking, boating, canoeing, rowing, etc. that you can enjoy here. During winter it becomes a favorite destination for bird watchers as the reservoir in the vicinity attracts a lot of migratory birds. At Kotdwar, there is never a dull moment. The pleasant climate, amazing variety of wildlife and good hotels will make the tour of Kotdwarmemorable. Christened after the legendary archer Guru Dronachariya, Kotdwaris among the most picturesque city and attractive tourist destination in India. 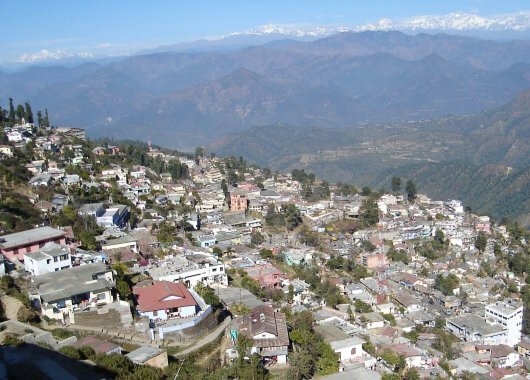 Pauri is one of the most beautiful places of Uttarakhand and is situated in the district of Pauri Garhwal. The beauty of this place can be ascertained from a simple fact that it is lined with Holy Ganga River on its South and mighty Himalayan Mountains on its North. Pauri is one of the most culturally rich places in the Garhwal region of Uttarakhand and is widely known for its traditional values. Here are top 5 places in Pauri that you should visit on your trip to this small town of Uttarakhand. Kandoliya devta is the local deity, referred in the local language as the bhumi devta. The temple has been in the area for years, amidst thick pine forest. In the region, it is a custom to begin every auspicious work with the blessings of Kandoliya thakur. Every year, a bhandara (feast) is held in the month of May–June in the temple. It is attended by lakhs of devotees. Nag Dev is a small temple located in the Pine and Rhododendron forest region. The temple belongs to the nag devta (the snake god). Located away, from the hustles and bustles of town, the place offers solace to the tired soul. Kyunkaleshwar Temple- This is an 8th Century old, Shiv temple believed to be raised by Adi Shankracharya. The presiding deity of the temple are Shiva, his wife Parvati and sons, Ganesha and Kartikeyan. The temple in itself is popular as a historic shrine and therefore visited by thousands of Shaivaites. Kyunkaleshwar temple is known for the artistic stone work done in the temple premises. The temple also has a Sanskrit Vidyalaya and Gurukul where young children come to learn Veds and Purans. Laxmi Narayan Temple- Located on the main Laxmi-Narayan Temple Road in the main city and is visited by locals round the day. The temple is named after Lord Laxmi Narayan or Vishnu. It also houses a Shiv temple, Hanuman temple, Durga temple, Ganesha Temple. The Hanuman Mandir in Pauri is located in the Deodar Forest. It is located around 2 km from the main city. Methodist Church, Chopra- The church is over 100 years old and is located in the lower chopra region of the town. The church is located a stone throw away distance from MIC Pauri. The church belongs to the catholic community based in Gadoli region. Dhara Road- It is a flourishing market area in the city, having small and big shops selling a variety of things. Khirsu- It is located 15 km away from the Pauri city. This small, tourist village has Apple orchards and huge gardens which remains filled with flowers and fruits in Spring. The region is known for offering a spectacular view of Himalayas. It is located 4 km away from Pauri and overlooks the Idwal Valley and Chaukhamba Peak. It is situated in the dense forest of oak and rhododendron. It is located at a distance 2.5 km from the town. One of the highest points in Pauri, Ransi is a beautiful picnic spot. It has a Sports Stadium - the second highest stadium in Asia where games and tournaments are frequently organised. An ideal picnic spot, the stadium set amidst deodar trees. Most of the local sports are organized in this ground. The library is open round the year for enthusiasts and houses a variety of books. Pleasant walk during the whole year. Popularly called the "queen of the hills", this wonderful place is famous for its scenic beauty and towering snow clad mountains present awe-inspiring view. This small town of Mussoorie has an atmosphere that is reminiscent of a fairytale. The glittering view of the Doon Valley and the Shivalik range are simply spectacular. The climate at Mussoorie is pretty chilling in the winter. It is however pleasant in summer. The murmur of the cascading waterfalls is charming. The woods in the neighborhood offers a fine hiking trail. It also acts as a wonderful ecological reserve. The place around Mussoorie is simply fascinating and there are many a wonderful destinations tourists head for, the moment they arrive here. At an altitude of 1370 m from the sea level and almost 15 km away from Mussoorie, you will have the opportunity to see one of the finest waterfalls in India. From a great height water cascades down a hill and dives straight into a plunge pool. A narrow winding stair will lead you to the plunge pool and the view of the waterfall from the very bottom is breathtaking. There is dense vegetation in the area and you will surely love the rippling cascade. Some other attractions of the area are the artificially created Mussoorie Lake where there are sports and leisure facilities like boating. You can also pay a visit to the Municipal Garden. It is extremely beautiful. Only 5 km from Kempty Falls you will find a great picnic spot called Lake Mist. Mussoorie is so beautiful that it seems tailor made to be fascinating. This is the second highest peak in Mussoorie. The hill offers a panoramic view of the Himalayan range like the Srikantha, Pitwara and Gangotri. The hill has a piece of history associated with it. During the colonial rule, the hill had a gun mounted on top of it. Everyday at mid-day, the gun was fired from atop the hill so that people could adjust their watches accordingly. It is at a distance of 400 m and can be accessed by a ropeway. You can also walk to the spot and it will take no more than only 20 minutes.